Today's post is a tutorial on how you (yes, you!) 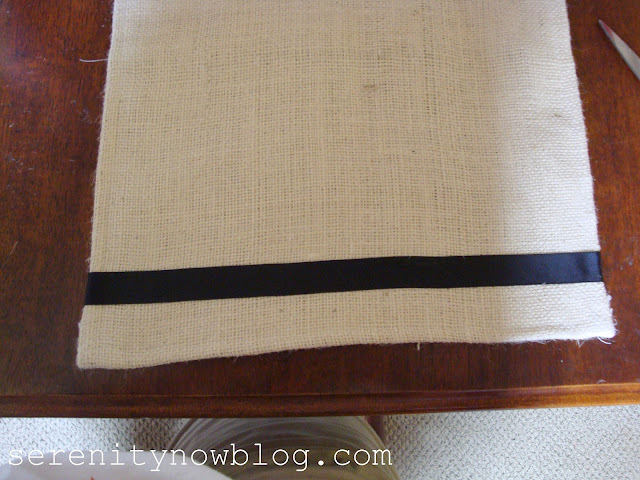 can create your own embellished burlap table runner. There are a lot of pictures, because I happen to like pictures. My table runner's inspiration comes from a photo I saw featured on Rhoda's Burlap party. The one with the "D" on it was handmade by someone for Kasey. I don't have a seamstress on loan, nor do I have an embroidery machine. I was going to have to do this the thrifty way! Armed with my 40% off coupon, I drove the girls over to JoAnn Fabric, and prayed that on this particular trip no one would cause a big scene over crackers or wanting to run away walk next to the cart. I found burlap for around $3 a yard. I got one yard for 40% off, and the second yard for something like $1.50 because it was the end of the ream. Then I came home and left it on the Dining room table for a week. I've mentioned before that I am new to sewing, and projects involving fabric make me nervous. 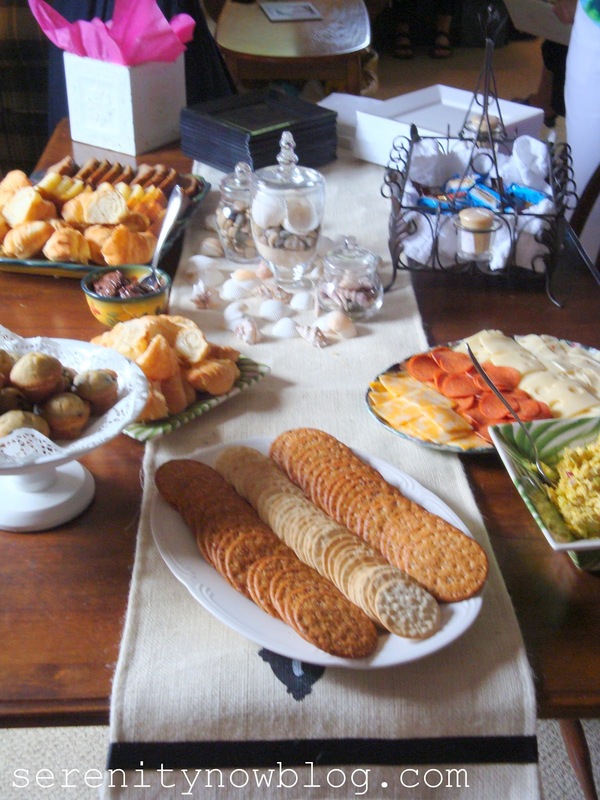 But I knew my sister's bridal shower was fast approaching, and I needed a cute centerpiece! My mom helped me to measure and cut the fabric. It was basically just two long rectangles. I lined my burlap rectangles up and folded one of the long sides up to create a seam of about 3/4 inch. I pressed the seam as I measured/folded it to make it easier for sewing. After I finished folding/measuring/pressing a section, I'd pin it off. The whole side looked like this when I was done. Then I stuck that baby in my sewing machine, lining up the seam on a spot I thought I could probably keep lined up. Anyone ever notice how the sound of a sewing machine is a siren's song to young kids? Natalie and Michaela Byrd came running when they heard the machine start up, and Natalie wanted to sew something herself. Michaela Byrd just wanted to touch the shiny sharp needle. Needless to say, the sewing took some time because I had to keep distracting them with toys, food, cartoons, you name it! At some point, I messed up threading the machine, so I had to take several deep breaths and read the manual to fix my problem. When one long side was sewn up, I folded/measured/pressed the other long side, and sewed it up too. This is what the finished side looked like when I was done with the long sides. I wasn't crazy about the unfinished ends, so I did the same folding/measuring/pressing process to those. Just like wrapping a gift! Y'all know I love my Fabri-Tac and black ribbon! I have an endless supply. I'm not sure how I ended up with so much black ribbon, and the Fabri-Tac lasts forever! I've used both items on several different projects, including the window treatments in our new room. I measured up from the seam an inch or so on each end, and I glued my ribbon down using my Fabric-Tac. I made a dash horizontally every few inches with disappearing ink so I would know my ribbon was straight. Not done yet! I measured up from the ribbon and made another mark for the center of my stencil! I finally made some real use out of my Cricut machine, and cut a stencil of a cute little frame. I grabbed my black fabric paint and went to town filling the stencil in with a sponge brush. Burlap soaks up a lot of paint! Stencil by itself. It's not perfectly centered. I told you I'm not good at math. This would drive my perfectionist husband mad, but I am recovering. 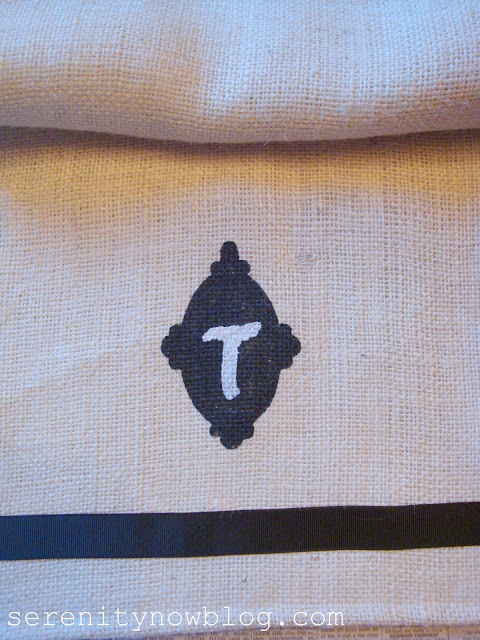 I also had my Cricut cut out a "T" and when the black paint was dry, I stenciled that it over top. I did this on both ends of my new runner. No, it's not perfect, but it's beautiful to me (to paraphrase The Nester) because I made it! The whole project cost me around $3 because I had everything but the burlap on hand. Since this seems to be the week of the bridal shower/wedding posts, I'll give you a quick sneak peak at what this table looked like as we began adding food during the shower. Hope you enjoyed my little tutorial today! Cool!! Aren't you so clever??? It looks very nice!! 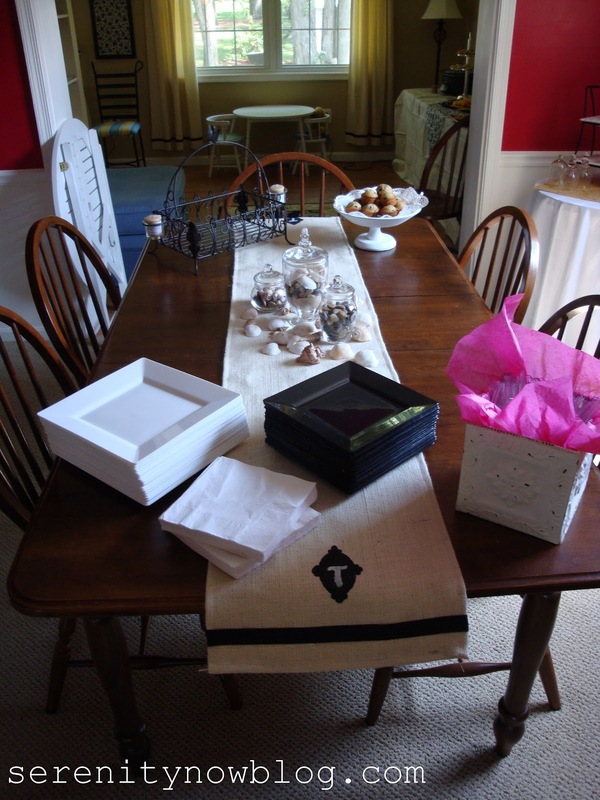 I am loving your table runner! I have a bag full of burlap in the basement and so many ideas for it. Just not the time to put into it right now. Found you over at Whimsy by Victoria today. So glad to meet you! Amanda that runner looks fabulous. Great job. Love it! I am so into monograms lately! i'm so jealous because you have a cricut & i don't! helpful tip - when the fabric is too thick to sew with the foot pedal, you can move the round wheel thingy on the far right of the sewing machine toward you & hand advance it instead of using the foot pedal. give me a minute & i'll remember what it's really called. (humming tune to jeopardy now) sorry, can't think of what it's called, my mother would be so ashamed of me right now! anyway, it'll let you sew through the thick fabric one stitch at a time. your table looks beautiful from the shower. wish i could enlarge it to see everything. Love your project. Thanks for the tutorial! Great job! I really love how you used the Cricut!! 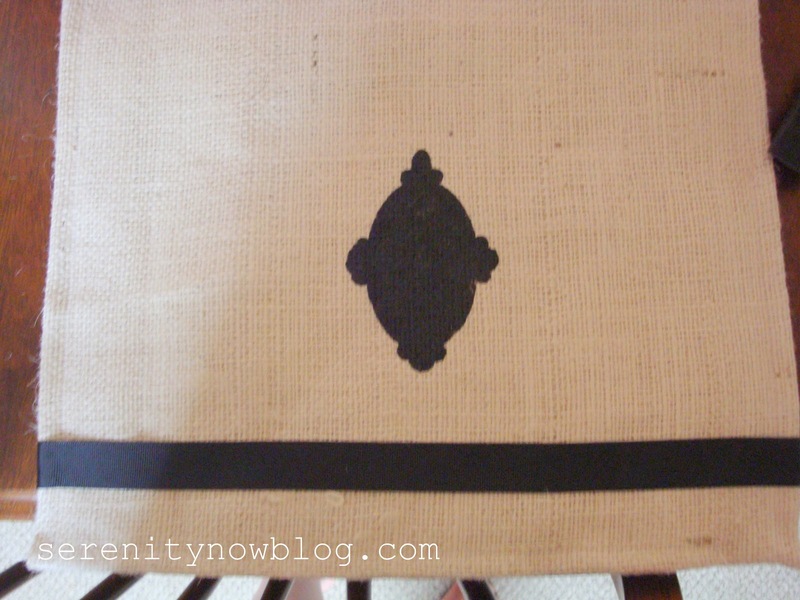 Who can resist a pretty burlap project? Yours turned out great! It came out so prettily - congrats on being able to finish it with kids underfoot and distracting! I love the runner. I might have to steal it for a MOPS craft-so fun! thanks for sharring. CUTE! I'm just obsessed with burlap! The runner looks fabulous! I have also bought cheap iron-on monograms off the internet and just ironed them on. and I mean cheap as in $1.50. I like this! 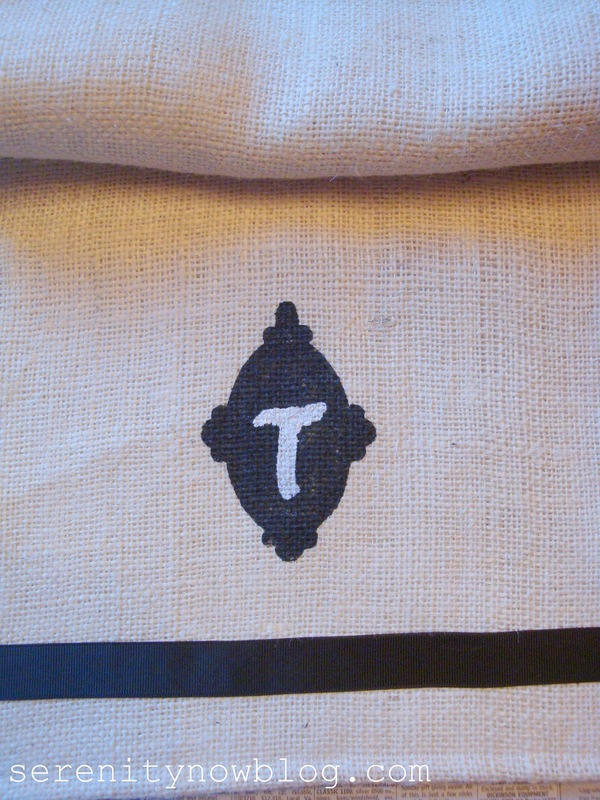 I REALLY love the black ribbon on the burlap. That was an inspiration! Oooh, I really love this! You did such a great job :) Thanks for sharing your tutorial. I just picked up some burlap last week from HL. You've got to love burlap - yours looks awesome! Your project looks beautiful! Great job :)!! Acckkkk...the runner looks FAB! I love the little stencil you made with the Cricut. I'm gonna have to try that. Girl, you are a blogging machine. I can hardly keep up with all your posts. Let's see...Nanny is precious, The pink punch made my mouth water (def. making that soon), and HAPPY AANNIVERSARY you crazy kids! Whew, now I'm all caught up. I love it! Thanks for great idea! Well done! I love the ribbon accent! I made my own expensive looking Pottery Barn inspired typography basket~come see. AMANDA -- THAT'S AWESOME! I got a sack full of burlap at Goodwill this weekend for $3 -- thanks for the great idea to use some of it! I'm having a Feathered Friends party the same day as yours, but I think I'm going to link up to yours, too, cause I need some help! You did a great job on that runner! I love it...you are my hero. I am soooo not good a sewing! I do want to learn though! You did a GREAT job on your table runner, especially for being so nervous with a sewing machine. I love to sew things like curtains and table runners but not clothing so much-I can, just don't enjoy it. If you would like any tips to help with your next project (ex:sewing corners) I can give you a couple of helpful hints to make you less nervous next time-but you did do a great job. It looks great. I hope you come back for more events. This will go on each Monday. you did such a good job! it looks like you bought it at some $$$$ store. great knock off.